Barcelona coach Ernesto Valverde has admitted he views Atletico Madrid as a greater threat to his side winning La Liga this season than Real Madrid. Atletico, who play Getafe on Saturday, sit five points behind Barca in the table while Real's stuttering campaign means they are already 10 adrift of the league leaders. Real have shown signs of a return to form in recent weeks, having won four out of their last five matches, including an impressive victory over Sevilla. Sevilla sit third, ahead of Real on goal difference, but after playing a game more. "We look more at who is immediately behind us," Valverde said at a press conference on Saturday. "I value both Atletico and Real Madrid very highly because one is a great team and the other never gives up. But you have to look more at the one that is five points behind." Barcelona have made four signings in the January transfer window, their latest move a 75-million-euro ($85.5 million) deal for Ajax midfielder Frenkie de Jong, who will arrive in July. De Jong has said he spoke to both Manchester City coach Pep Guardiola and Paris Saint-Germain's Thomas Tuchel before making his decision, but not Valverde. "You cannot talk to a player who has a contract elsewhere and it's not my way of doing things," Valverde said. "I have nothing more to say about it." Kevin Prince-Boateng has also arrived from Sassuolo and Jeison Murillo from Valencia, each on loan, while Jean-Clair Todibo has agreed to join from Toulouse next summer. 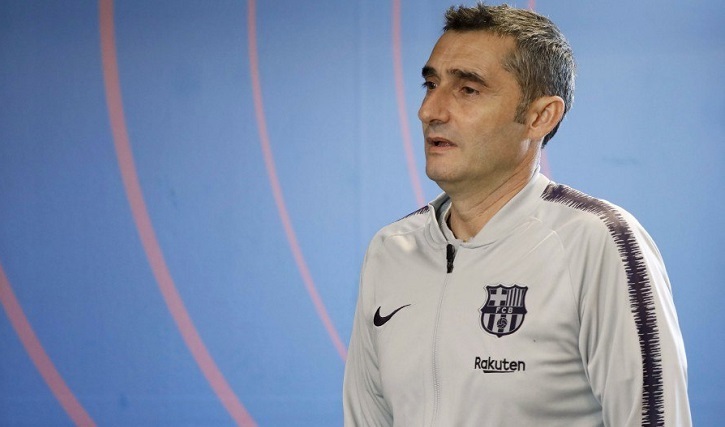 Asked if he has the final say on signings, Valverde said: "I talk to the technical committee and we have normal conversations. I never speak in absolute terms, that someone has to come, no ifs or buts. We speak generally and talk about options." Valverde has admitted the club could allow fringe players to leave this month, with Denis Suarez and Malcom both linked with moves away. Suarez was dropped from the squad to face Sevilla in the Copa del Rey on Wednesday to make way for Boateng, while Malcom started, but struggled, and came off after 63 minutes. Both are in the squad to face Girona. "He has many qualities," said Valverde, speaking about Malcom. "He is direct and can make something happen. "He has to be more aggressive and have more consistency in his game. Nothing is missing but there are others who play and you have to choose between them all." Barcelona's game against Girona at Montilivi on Sunday had been the fixture identified by La Liga to be played in the United States. The plan, however, fell through due to a lack of support from governing bodies like FIFA and the Spanish FA (RFEF), although both Barca and Girona had supported the idea. "I saw it as a distant option," Valverde said. "They had to fulfil conditions for it to be played in Miami that in the end were not fulfilled. "We were willing to play where they said, it was not important to us and I didn't lose sleep about it. We will see in the future." Ousmane Dembele will miss the game this weekend with an ankle injury while Samuel Umtiti is still recovering from a knee problem. Rafinha is also out with a ruptured cruciate ligament.